Get yourself back "In the Loop".....Allow your hearing aids to be your own personalized speakers! The loop system is an aid for the hard of hearing. It consists of a loop of thin cable around a designated area, which generates a magnetic field picked up by the t-coil of a hearing aid. EASY INSTALLATION. You are able to install the loop system yourself or you can call a professional to install it for you. DISCREET. No need to display “I am hard of hearing!” with a visible headphone or wires. HEARING AID COMPATIBLE. There’s no need to juggle between hearing aids and headset. PERSONALIZED SOUND. Deliver personalized in-the-ear sound that is customized to your hearing loss. 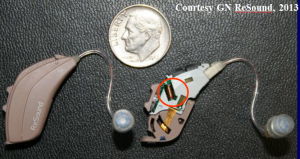 A telecoil (or t-coil) is a small coil of wire inside a hearing aid that is designed to pick up a magnetic signal. When using the t-coil setting on your hearing aid, it turns off the microphone so that it will only pick up the electromagnetic signal and converts it to sound. This allows you to hear only the magnetic signal from the sound source which can be from hearing aid compatible phones and a number of ALDs (Assistive Listening Devices). T-coils are available on most BTE and ITE hearing aids. The smaller aids such as ITC and CIC may not have the room for a t-coil. 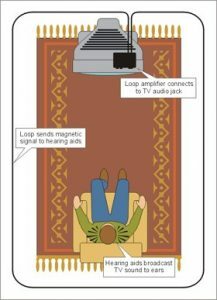 Will my hearing aid work with a hearing loop? More then 60% of all hearing aids, except the tiniest custom hearing aids have a t-coil built in. 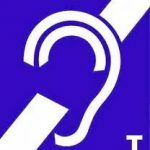 More then 90% of severe hearing loss persons have a hearing aid with a t-coil built into it. To be able to install a loop system, the wire needs to run under the carpet or alongside or inside the wall. If you are building a new home or replacing your carpet in your existing home this is a perfect opportunity to be able to install the loop system with ease.